for you car gift? This giant red car bow is your right choice. car side mirrors decoration etc. is put in front of your gift car. to assemble the giant red car bow. Car Bow Size : 23 inches. Accessories : 10 x little car bows. Stick Method : Magnetic x 2. 2). Use the 10 extra small ribbon bow for practice. the plastic under the car bow. Why not add a little bit ore WOW to you car gift? Click "Add to Cart" and bring this giant red car bow to you car gift now. 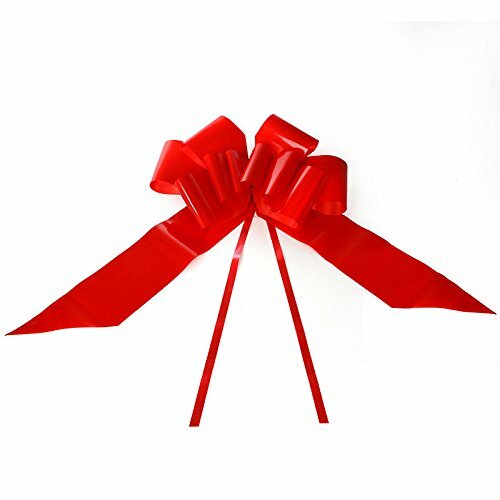 Huge Red Car Bow - 23" size ribbon made car bow that is put in front of your gift car. Easy to Assemble - It takes less than a minutes to assemble the giant red car bow. Definitely Add WOW - Putting a huge car bow in front of your car gift will surprise your daughter or son who is going to have your car. Magnetic Base - Have the giant bow stick to the car front and be removed easily after use. Car Bow Size : 23 inches. Color : Red. Quantity : 1. Accessories : 10 x little car bows. Stick Method : Magnetic x 2.